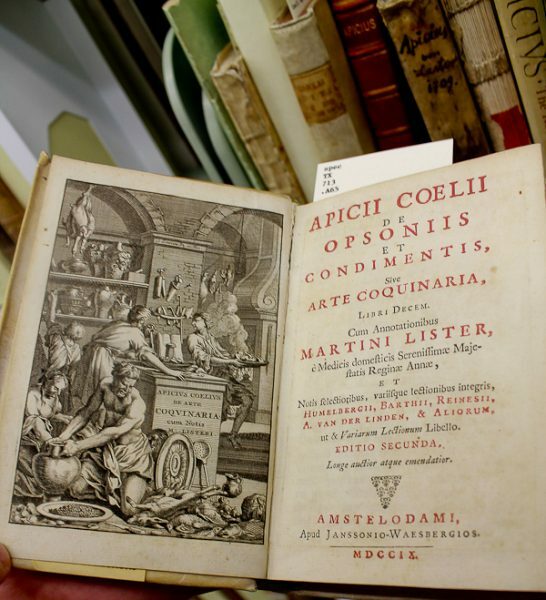 Apicius de re Coquinaria is a collection of ancient Roman cookery, thought to have been compiled in the late 4th or 5th century A.D. and the oldest known cookbook in existence. 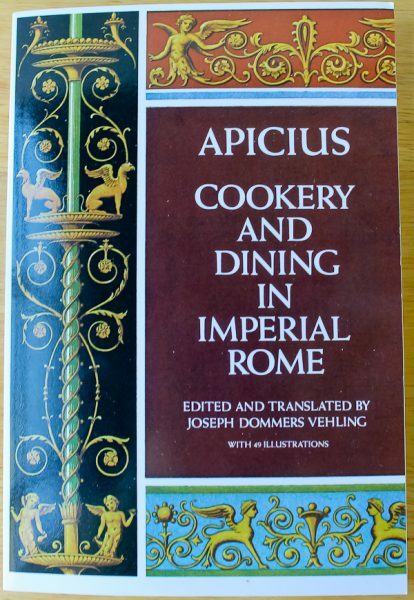 Marcus Gavius Apicius was a Roman gourmet who lived sometime in the 1st century. 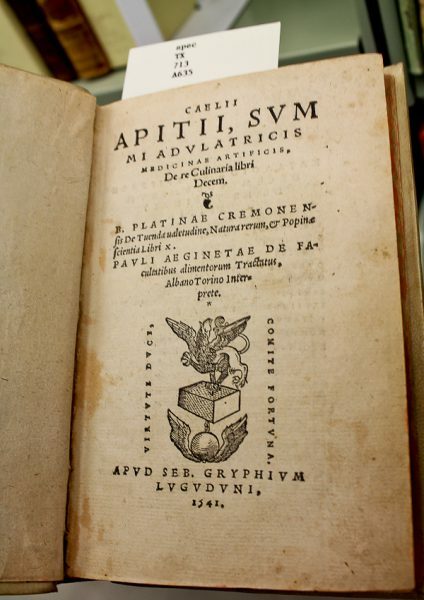 He is sometimes erroneously asserted to be the sole author of the cookery book, but it is the name itself that is associated with the love of refined food from the habits of this early bearer of the name, but at the same time, he is believed to be the “real” author or collector of many of the “recipes.” The Apicius book is a gastronomic bible, consisting of ten different books by several other authors over time. It is more a series of guidelines than actual recipes. There are no measurements and techniques are described as “cook over a low fire,” or “boil.” Obviously, there is so much history to Apicius that I could never convey it all to you here, and I highly suggest reading about its intriguing history in the English translation which I happened to receive as a birthday gift from my husband Bill this past Friday. And so begins the story of what turned out to be one of the most incredible and very different dining experiences to date. As I started to unwrap this book as a gift from Bill on the morning of my birthday, he told me that it was going to be a hint of what we would be doing that evening. It only took less than thirty seconds for me to figure it out. Bill knows my favorite restaurant in Chicago is NEXT. Next is exquisite and dining there will excite all your senses. It is not just dinner, it is an experience. And not just any experience, but a time-travel and/or world travel experience. The menu changes every few months, each with a unique theme. Since opening in 2011, some themes have been Paris 1906, Childhood (my favorite! ), The Hunt (Bill’s favorite), Sicily, Chicago Steakhouse, A Taste of Thailand, The French Laundry (from the 1980’s) and Vegan. 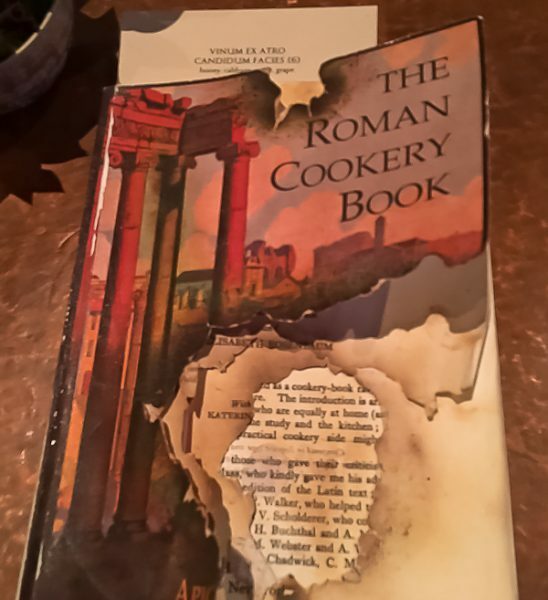 I knew that Next was now offering Ancient Rome as its current experience and the cookery book was the perfect hint. I was more than ready for the next dining adventure. 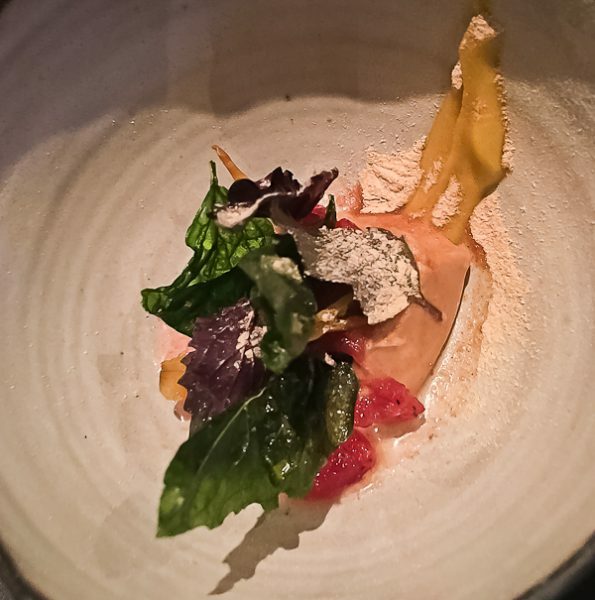 James Beard Award-Winning Chef Grant Achatz, owner of Next, was given the English translation of Apicius by Executive Chef Jenner Tomaska and they knew it would be on the menu. It was challenging, intriguing, and allowed for a large amount of creative interpretation. They have said that guests have come in expecting pasta and what they believed to be Italian. One only has to look at the book that is set on every table to know that pasta is not on the menu. Along with the book is a menu (on the right) for the evening with the dishes indicating which page to open to read about each course. 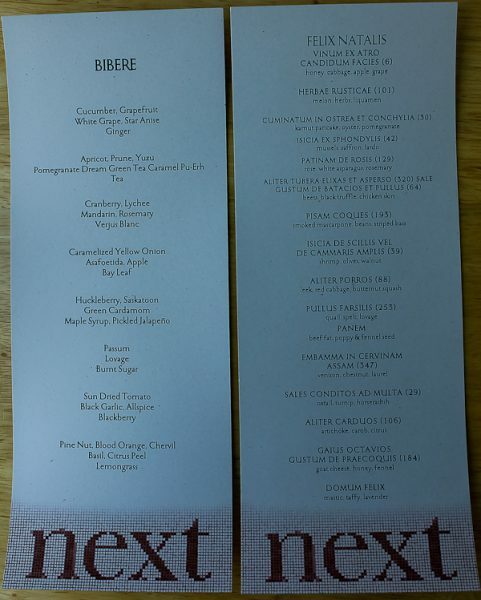 The menu on the left (Bibere) is the beverages paired with each course. When ordering tickets to reserve a table at Next, you select either alcoholic or non-alcoholic beverages. Bill (and I’m guessing help from daughter Kristina!) selected non-alcoholic for a couple of reasons. First of all, we are about an hour-long drive from Chicago and it’s obviously not a good idea for Bill to be full of wine, but also because the non-alcoholic beverages are always so interesting at Next, and especially this time when it would most likely be juices made from Ancient Rome ingredients like fruits and vegetables. It was an excellent choice. They were incredible. Before I begin the courses, let me say the service is impeccable. Someone suddenly appears at your table for every need, and they are all friendly and knowledgeable. A server appeared and explained about the menu, how to use the book placed on the table, and gave us interesting history facts about Ancient Rome. The first course was served just a few minutes later. A beverage arrived first consisting of honey, cabbage, apple, and grape that sounded strange (as do many of the juices) but it was delicious. A few seconds later two small plates appeared. On the right is cooked bitter greens and edible flowers inside a compressed melon. 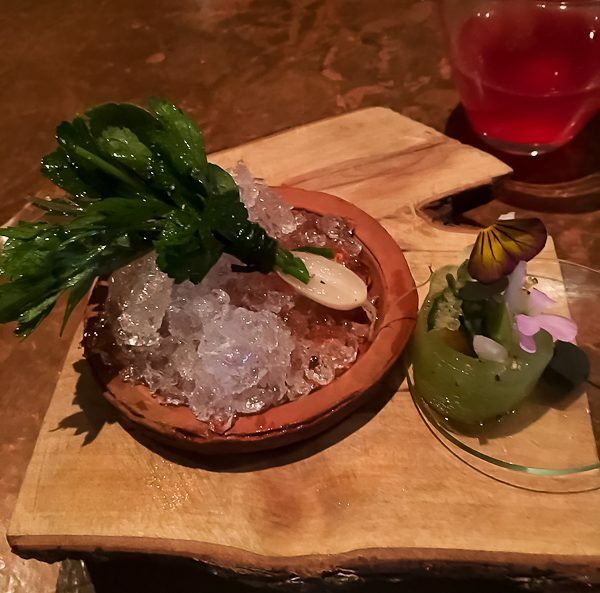 On the left is a bundle of leaves that tasted peppery and salty and sitting on ice. 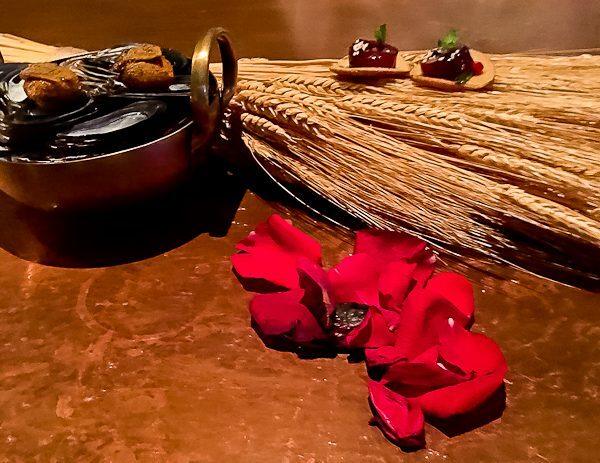 Wheat sheaves were elegantly placed before both of us and topped with a raw oyster suspended in a pomegranate gelee and set on a kamut pancake; in a bowl were mussels with hints of saffron, honey, and I think a little anise. Rose petals were scattered, and nestled in between was a smooth bite of pureed asparagus with rosemary in some kind of coating. There are so many flavors and textures bouncing around your mouth, and then add a sip of juice, it is enhanced even more. It was a mixture of cucumber, grapefruit, white grape, star anise, and ginger. What came next was probably my favorite perfect bite – a chunk of preserved Perigord truffle! How could it not be? I could have had half a dozen more tiny bites of those. 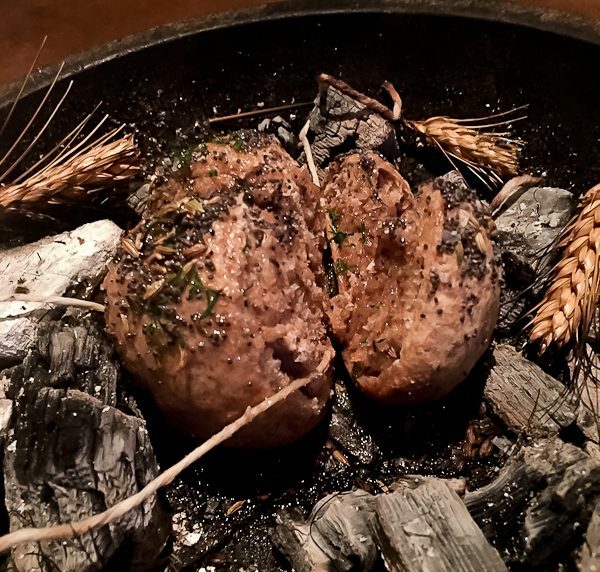 The truffle was wrapped in crispy chicken skin and skewered. 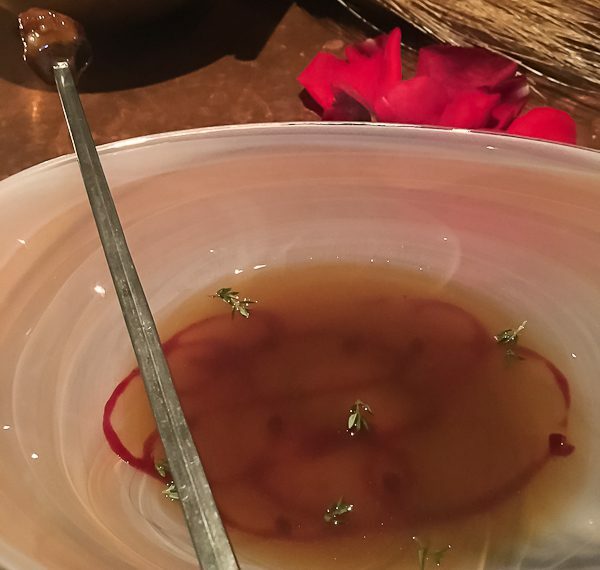 The skewer was placed on a bowl of beet broth with a design using fermented beets and fresh thyme leaves. The juice was apricot, prune, yuzu, pomegranate dream green tea, caramel pu-erh, and tea. 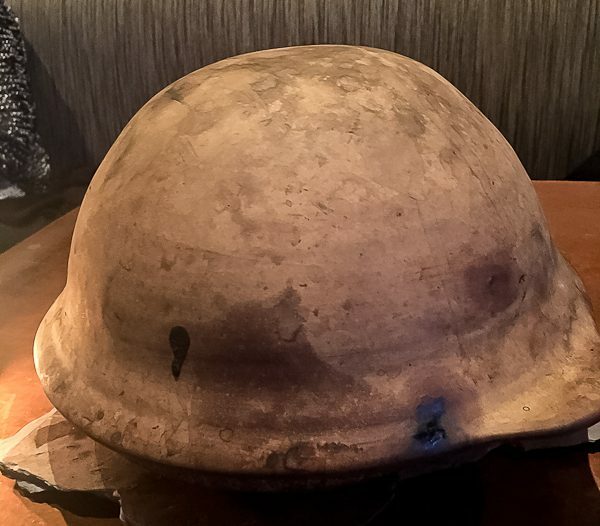 The following dish cover looked like an ancient helmet. When the server lifted it, a warmth and wonderful smoky aroma floated out. Behold a tabletop fire pit! 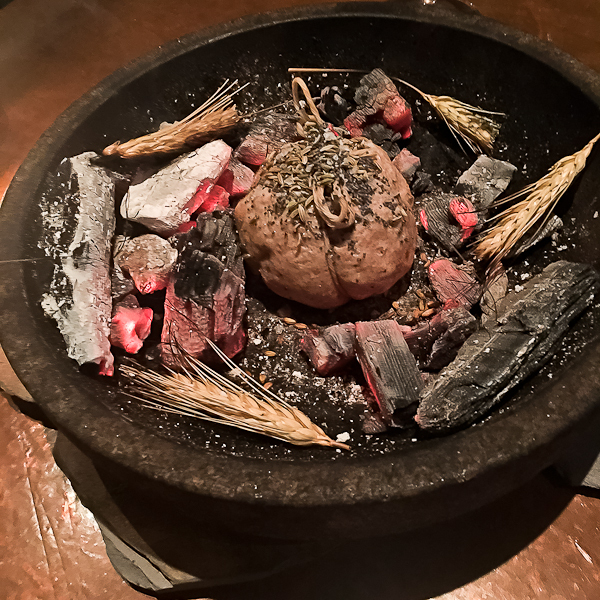 In the center of the glowing embers was a piece of uncooked sourdough bread, about the size of a large dinner roll. It was tied with string and sprinkled with fennel and poppy seeds. The server explained that the cover would be replaced and the bread would bake over the next couple of courses. Meanwhile, two fish courses followed in gorgeous plates. 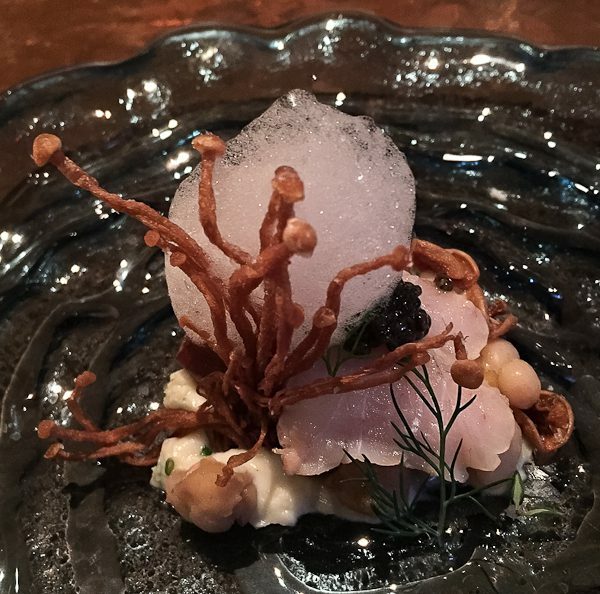 First up was a striped bass sitting on a bed of smoked mascarpone and accented with fried enoki mushrooms, osetra caviar, and a garbanzo bean foam. Heavenly. The photo does not do justice to this intricate mosaic platter. 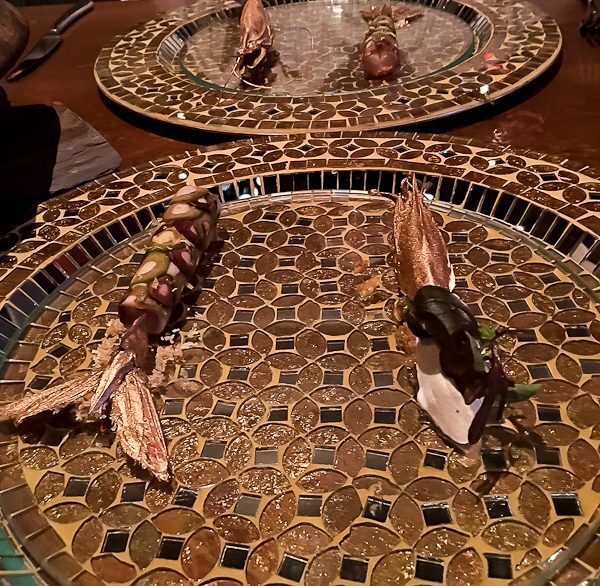 Sitting upon this showpiece was a prawn mousseline wrapped in thinly sliced olives, looking themselves like mosaics, and placed next to the gold-plated (inedible, just gorgeous to look at) prawn shells. The cranberry, lychee, mandarin, rosemary, verjus blanc beverage was stunning. 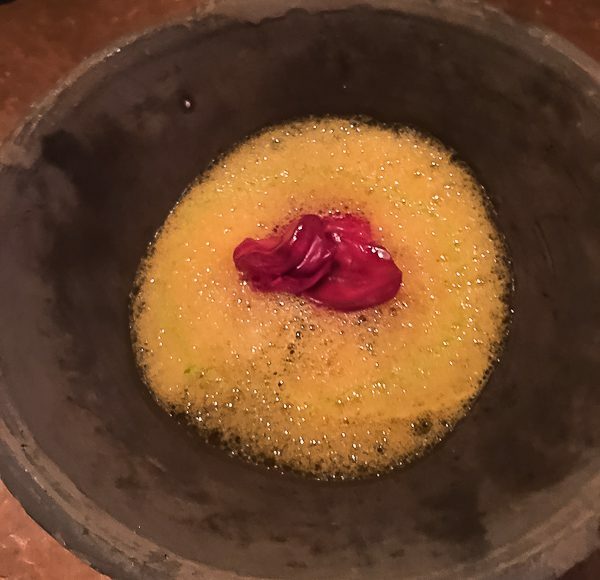 When I saw that the upcoming course was an odd-looking creation of leeks, red cabbage, and butternut squash, with a paired beverage of caramelized yellow onion, asafoetida, apple, and bay leaf, I feared Bill would turn his nose up at them. Again, the strange combinations worked and he ate every bite. 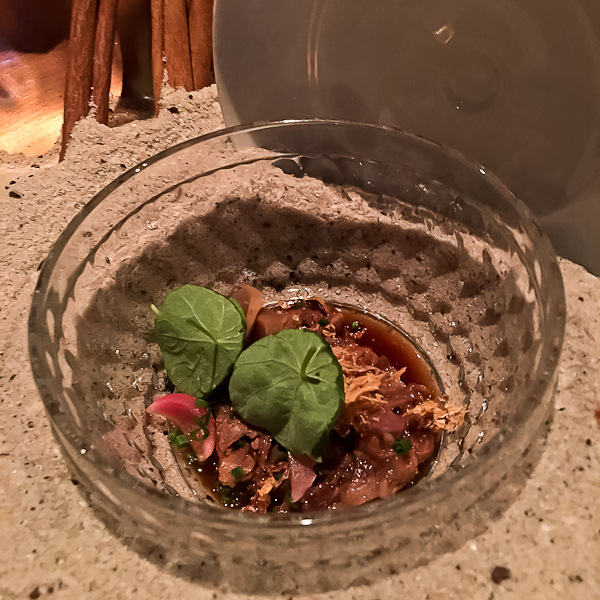 The next few courses were made for Bill and he couldn’t get enough – quail, venison, and oxtail. 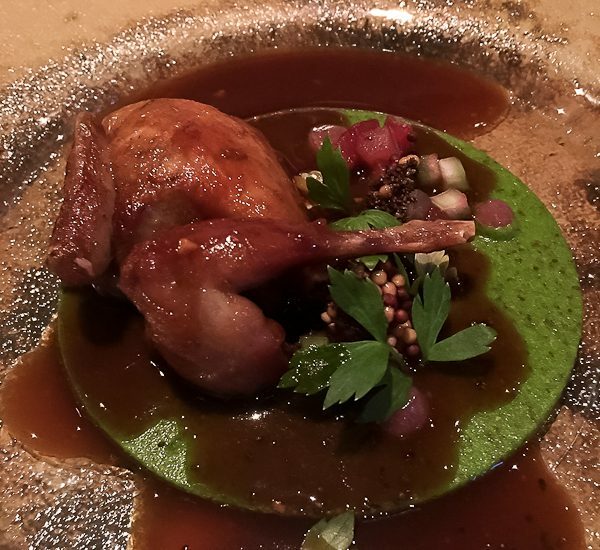 The delicate and perfect piece of quail was stuffed with a liver and heart forcemeat and placed on a perfect bright green disk of velvety compound butter and spread lavishly with a mustard-honey sauce. The beverage had a kick to it with huckleberry, Saskatoon, green cardamom, maple syrup, and pickled jalapeno. 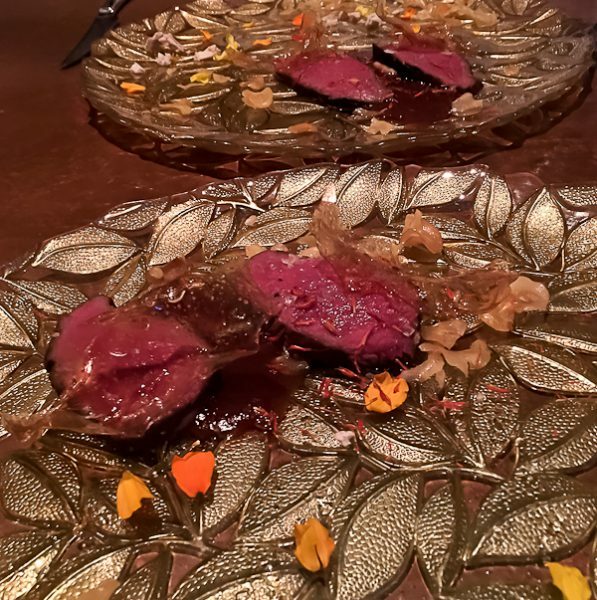 A dazzling gold leaf platter was used for the venison that was served with fried chestnuts and complemented with a prune and date chestnut puree, probably the ancient Roman version of a barbecue sauce! The beverage contained passum, lovage, and burnt sugar. The oxtail and preserved vegetables were baked in aromatic salts, the ancient Roman method of preservation. 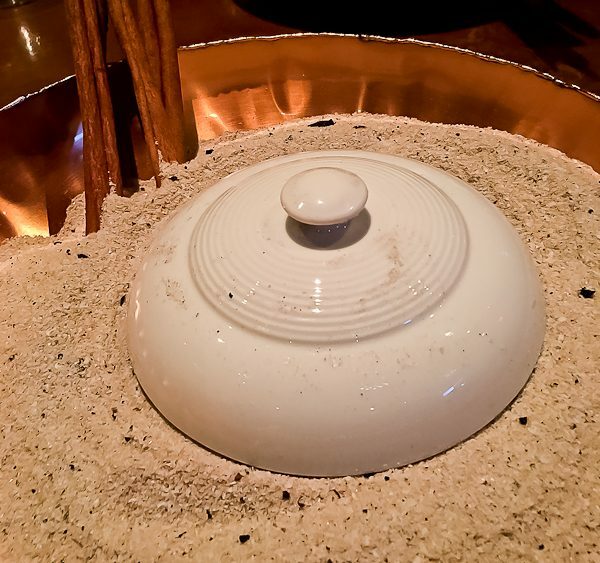 A large dish arrived covered in the salt which was then brushed away by the server to reveal the lid. Pieces of burnt cinnamon sticks were inserted into the salts and not only looked stately but had an intoxicating aroma. Under the lid a lovely glass dish held the tender oxtails with turnip and horseradish. The beverage was my favorite of the night with sun-dried tomato, black garlic, allspice, and blackberry. All I could taste was the allspice and blackberry and I loved it! The meal is now winding down to the sweets. As you can probably surmise, many sweets of the time involved honey, lavender, and citrus. We were surprised to find artichoke on the introduction to the sweet list. Mixed with carob and citrus, it was, well, sweet! I know it doesn’t look like a dessert, but it tasted like one. The beverage for the sweets contained pine nuts, blood orange, chervil, basil, citrus peel, and lemongrass. 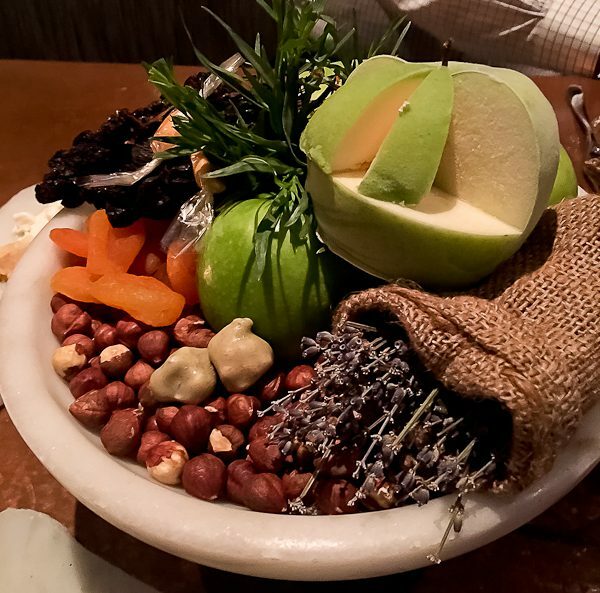 The ending was a great heavy bowl placed in the middle of the table, laden with fruits and herbs, with tiny bites of apricot taffy and lavender hazelnuts poking out just so you can barely seen them, but you couldn’t wait to take a bite. It looked like a painting. 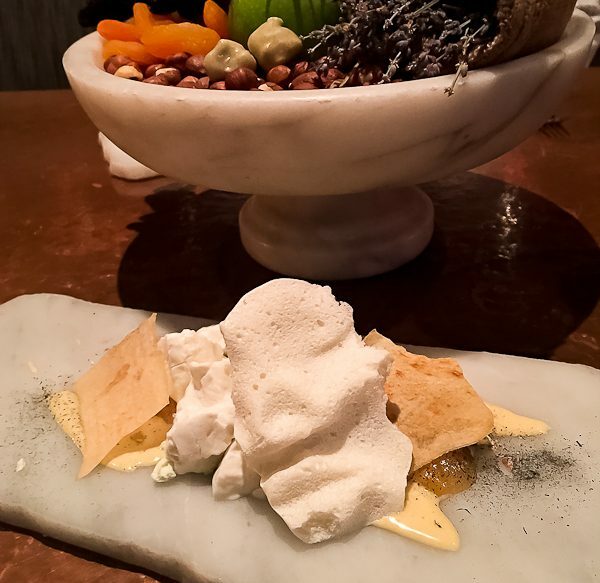 Lastly, a plate of goat cheese ice cream, honey custard, fennel pate de fruit, and pistachios were topped with pieces of broken meringue, meant to evoke the inevitable fall of Rome and the ruins. All good things must end, but the experience of this meal will live in my mind for a long time to come. I learned that the ancient Romans were much more refined than we may expect. Apicius may be a frail, hand-written record but so much of it speaks to us today. We still preserve, dry, cook over fire, steam, boil, and many other methods. The utensils are similar except the old were hand-made and ours more modern. Many methods have lived through centuries and will continue to do so. 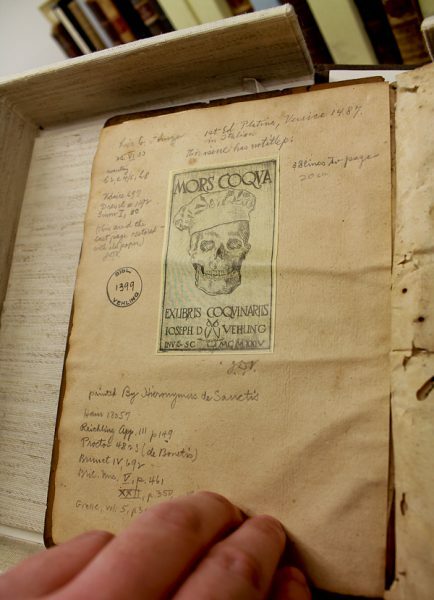 Keep handing down your family recipes, share them with the world, preserve them. Most importantly, just like ancient Romans, we still have the same love of food and can eat and laugh together. Photos of books taken by me at Hale Library Cookery Collection, Kansas State University. 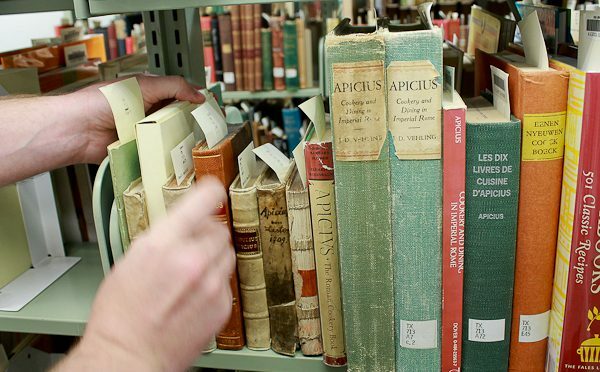 Thank you, Roger Adams, for letting me view and hold all of your precious Apicius collection! Living the dream through you is always a delicious and enlightening experience. Happy day! Lisa, you would LOVE this place. Someday we must go there together. Looks fantastic–such interesting food combinations. I have always wondered how he comes up with all of them. He definitely thinks outside the box. This is the most interesting and I would think, difficult, to date. I can’t wait to see what he does with Hollywood. Wow, interesting! I’m never organized enough to get tickets, but that sounds like fun. Anna, the next menu starting in May is Hollywood! I bet Emma would love it! Also, it is not noisy at Next at all, not like Roister. It’s just much more expensive than Roister, and costs less if you go during the week rather than the weekend. Problem is, sometimes it can be hard to get tickets. Oh, my! What a grand experience in Ancient Rome! I hope you both wore your gold embroidered togas!! That is a birthday you will never forget. Thanks for sharing with us. Great photos. Wish we had a NEXT restaurant in our area. Wish you did too. NEXT is definitely an experience!